An annual physical exam is a time for you and your doctor to check in on your health. It’s a distraction-free time where you and Michael Temkin, DO, can discuss any current health concerns, screen for certain health conditions, and determine any necessary next steps to keep you in optimal health. 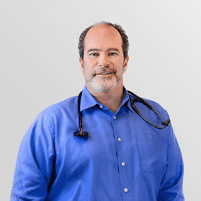 Dr. Temkin sees patients for physical exams at his primary care practice in San Ramon, California. If it’s been over a year since your last checkup, call or schedule an appointment online. How often should I come in for a physical exam? We recommend a yearly annual exam to check in on your health, assess your risk of disease, screen for certain health conditions, and discuss any needed next steps for your care. Note that most insurance plans fully cover one preventive visit every 365 days, so you’ll want to consult your calendar before booking your physical exam. What can I expect during my physical exam? As a primary care physician, Dr. Temkin is focused on establishing long-term relationships with his patients. The annual physical exam is a dedicated time to discuss your health concerns with Dr. Temkin and build a better understanding of your health history. A typical visit includes a dialogue, exam, diagnosis, and treatment. Dr. Temkin may ask questions about your medical history, home, work, and family life. At your annual physical, and during any office visit, he checks your vital signs: blood pressure, heart rate, respiration rate and temperature. During the physical examination, Dr. Temkin checks your ears, nose, and throat, listens to your heart and lungs, carefully checks abdominal organs, skin, and the health of your nervous system and musculoskeletal system, including your spine and joints. For women, a physical exam may include a pelvic examination, and sometimes a Pap test, although that’s not required every year for some women. Men’s physicals include a prostate and testicular exam. You may be asked to give a urine sample. If additional tests or blood work are needed, he can order them for you. Dr. Temkin will review the results of your examination with you and discuss what may be causing any current health symptoms. As a next step, he’ll suggest an effective treatment plan that works with your lifestyle. What kind of preventive screenings will I need?